Here's the latest digital camera from Nikon, the new Coolpix 800. The 1/2-inch 2.11 megapixel CCD delivers 1600x1200-pixel resolution in uncompressed TIF mode or one of 3 levels of JPG compression, 2x (38-76mm) Nikkor zoom, 1.8" color LCD, ISO 100 sensitivity plus Auto-ISO and ISO 100, 200 and 400 settings, 256-element Matrix, Center-weighted or Spot metering, fast image processing, 1.5fps continuous capture in full size or smaller up to 10 images (up to 40 images at 30fps in 320x240 resolution) and many more features. The body is constructed of black, high-impact plastic and has a good feel to it. It sports a large "black and red" finger grip area that gives the user a very secure and steady grip on the camera. Here's a comparison shot of the slightly smaller Coolpix 800 and its "big brother" the Coolpix 950. The most-requested thing from Coolpix 700 users was a zoom lens and Nikon has added a 2x Nikkor optical zoom on the new Coolpix 800. 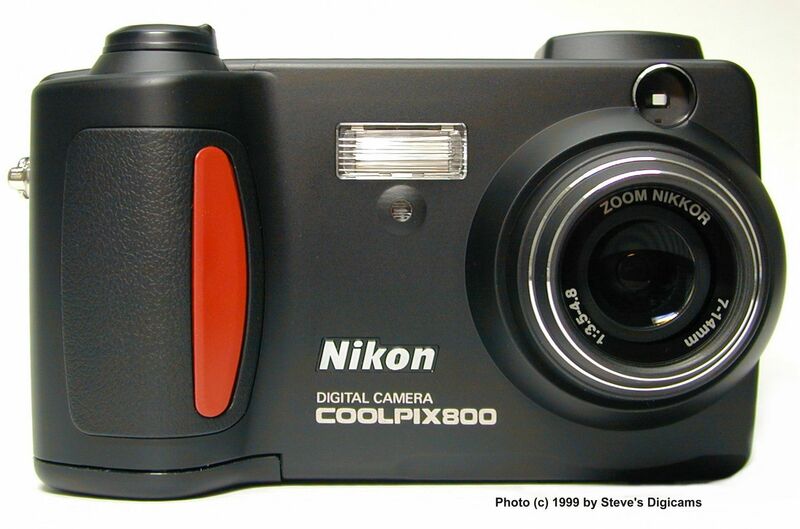 The Coolpix 800 also has a 2.5x digital zoom feature. And here's more good news -- the Coolpix 800's zoom lens is threaded. It accepts all lenses, filters and adapters that fit on the Coolpix 950. All of the goodies that fit on the 950's lens will fit on the 800 ! Here's the Kenko 8x32 scope mounted on the Coolpix 800. You can get one from CKC Power if interested. The optical viewfinder "bulges" up slightly from the body, it is coupled to the zoom lens but does not have any kind of diopter adjustment. There is a green LED to indicate focus lock and image processing activity. On the back is the 1.8" color LCD display that has a realtime (30fps) update rate. The Monitor and Menu buttons are below the LCD and the other two buttons on the upper right control the zoom lens. The top of the camera is where you'll find the majority of the control buttons. From left to right are: Infinity focus/macro/selftimer, exposure compensation, image quality and flash modes. The main mode dial is around the shutter button and lets you select A-Rec, M-Rec or Playback. There is also a monochrome LCD data display that shows all of the important camera features and their current settings. On the bottom we have the tripod socket which is on a flat surface unlike the Coolpix 950. However the CF (Type I) card slot and the battery door are also on the bottom which means the camera must be removed from the tripod to access these items. The CompactFlash card door seems to stay shut a lot better than the one on the Coolpix 950 but the card does not eject very far when you press the release button. On the side are the usual I/O ports consisting of a DC power input port, a serial data port and a NTSC video out port. Sorry no USB yet! The battery compartment makes up most of the finger grip area and is accessed by a swing-away door on the bottom. Unlike the 950 it does not have a safety latch but the release button is indented and requires some effort to unlatch. Here's a closeup view of the top of the Coolpix 800 and all the important user controls and LCD display. White Balance Automatic TTL homing system can be set manually for 1) Sunny, 2) Cloudy, 3)Incandescent, 4)Flourescent and 5) Flash. Preset white balance available for using a white card or target. Viewfinder Real image viewfinder; Magnification 0.32-0.6x; frame coverage approx 85%; LED indication for Speedlight Ready and Focus Ready. Best-Shot Selector Camera takes up to 10 shots (within 1.5fps) and records the most detailed image of the 10 using anti-jitter logic, not available when Speedlight is on. Capture Speed 1) Single mode: approx 1fps for full size or smaller. Users need to release the shutter button after every shot. 2) Continuous mode: approx 1.5fps for full size or smaller up to 10 images. 3) High speed continuous mode: approx 2fps for VGA size images up to 60 images. 4) Multiple continuous: approx 2fps, camera captures 16 images and puts them into one full size image 5) Ultra high speed continuous: 30fps up to 40 frames at 320x240 (1/4 VGA) resolution. Playback Function 1) Frame, 2) Thumbnails, 3) Slide show, 4) 2x or 3x playback. Hide and protect attributes can be set for each image. Battery Life Approx 100 minutes with LCD monitor on using alkaline batteries at room temperature. Accessories Included Soft case, wrist strap, Video cable, 8MB CompactFlash card, Serial cable (Mac and Windows), NikonView v2.5 CD-ROM, Lens cap, 4 AA batteries, Open-Me First envelope, registration/warranty card, Fast Track Guide; Hardware and Software manuals.